If you talk of Irish whiskey, most would say Jameson. Nothing wrong with that at all and it’s a great dram, but one brand that should get more of a shout out is Bushmills. Bushmills is a name that can date itself way back to 1608 when King James I granted Sir Thomas Phillips, who was the landowner and Governor of Co. Antrim Ireland, a license to distil. In 1784, a gentleman named Hugh Anderson registered the Old Bushmills Distillery and the Pot Still became its registered trade mark, a mark that adorns every bottle today. Huge hardship in the 1850-90 years, including powering through with the use of malted barley despite the introduction of the malt tax, and a disastrous fire that destroyed The Old Bushmills Distillery. After being rebuilt and back in full production, the early 1900’s saw Old Bushmills’ as the most ‘celebrated malt whisky’, winning numerous prizes in international spirits competitions, including the ‘only gold medal for whiskey’ at the Paris 1889 Expo. 1933 saw Belfast merchant Samuel Wilson purchasing the Bushmills Distillery despite being in the middle of prohibition and sales boomed, especially in the USA, after the war. Bushmills is still going strong today, and in 2010 Bushmills swept the board at spirits competitions across the world. So a rather lengthy history with some highs and lows, but how does the whiskey itself all come together? Every bottle of Bushmills starts with un-peated malted barley and ground into to a coarse flour or ‘grist’. It’s then mixed with hot water in a large mixing vessel, or a mash tun, to produce a sweet liquid called ‘wort’. Yeast is added which triggers alcoholic fermentation causing the wort’s sugars to turn into alcohol. The fermentation takes place in washbacks which are large fermentation vessels, and produces an alcoholic liquid similar to malty ale, called ‘wash’, with a strength of around 8% abv. The wash is then triple distilled in copper pot stills and then matured in oak casks for at least three years. Once matured, the whiskey is then blended and combined with different casks to find the consistent flavour. Different casks of malt whiskey are blended to find the right flavour, while malt and grain spirits are mixed for a blended whiskey. At Bushmills, they make both blends and malts, which is unusual in the world of whiskey. Once finished it is then bottled. Floral nose with slight spice following with a honey start on the palate. Hints of sweetness come through with a lingering, long finish of barley and a faint hit of spice. Matured for up to seven years in spanish oloroso sherry casks and sweet bourbon barrels. Red fruits, cream and soft floral elements on the nose, with pear, honey and slight raisin aromas on the finish. Honey favours developing into spiced cinnamon and cassia bark with quinine on the palate. Damp oak with heather and ripe cereal contribute towards the warm , very long finish with a bold spice. Only available to purchase at the distillery. Delicate sherry and soft biscuit aromas combine with subtle oak notes on the nose. Very light, thin honey with kicks of liquorice and figs are present on the palate, with sticky cinnamon and citrus fudge on the bold, long finish. Muddle the lemon, mint, water and simple syrup in the bottom of a mixing glass. Then add Bushmills, shake and strain into a glass filled with crushed ice. Garnish with a sprig of mint and serve. Simple! One to easily recreate at home, and indeed order at your local bar. 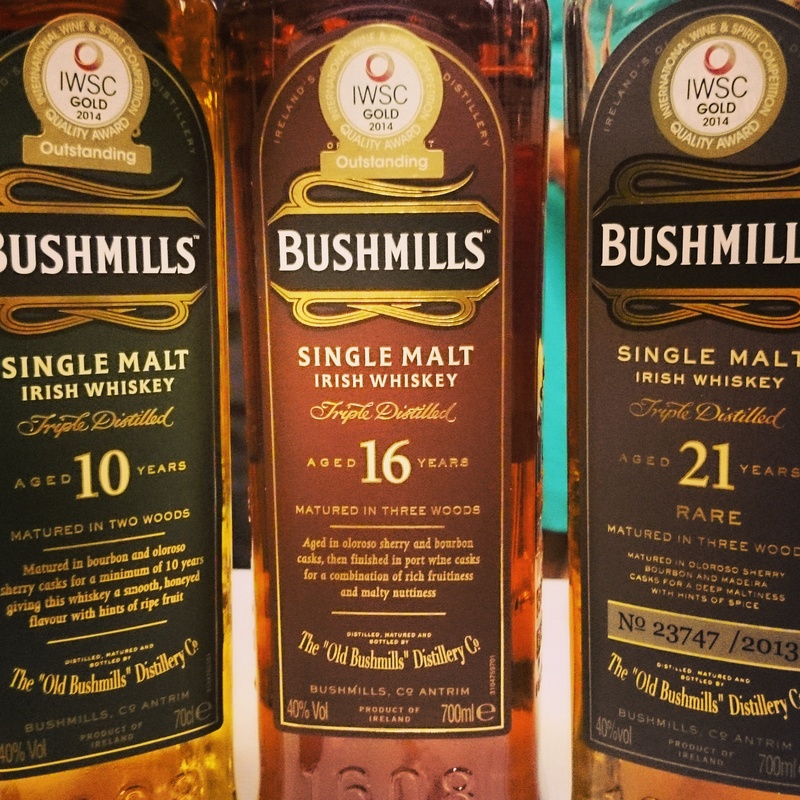 The Bushmills range also includes a Irish Honey variety. A great portfolio to experience! age. Very simple low impact nearly everyone could do this.